Wn12 Ouistreham Château D’eau (Daimler), K.V.U.Gr Riva-Bella, K.V.Gr Caen. 4 x R669 Casemate for field guns (60°). 1 x R610 Battle HQ for a strengthened company. 2 x R621 Group shelter. 2 x R607 Ammunition bunker II. 4 x 15.5cm s.F.H.414(f) guns. 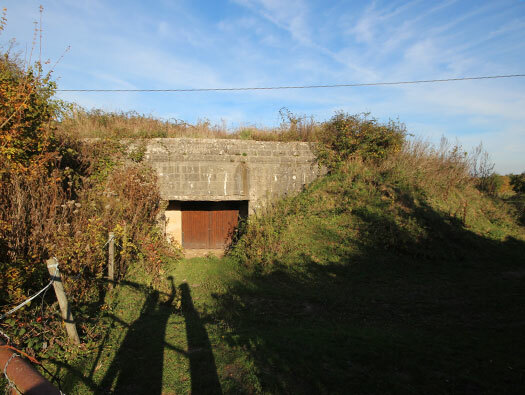 In 1942 a batterie of four 15.5cm s.F.H.414(f) captured French howitzers were stationed here. They would have been in field positions and covered in camouflage nets. 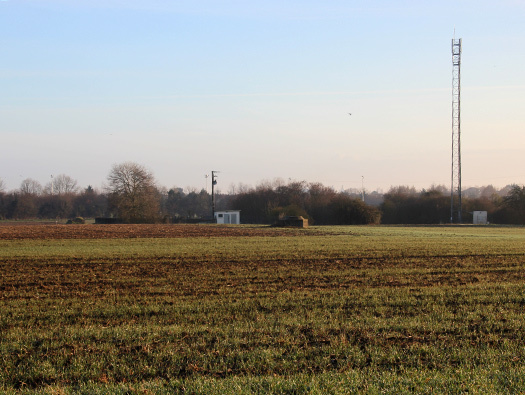 Earth and wooden command bunker and living either in tents or barracks in village houses, farms & barns. At a later date a wooden barracks were built for the troops. 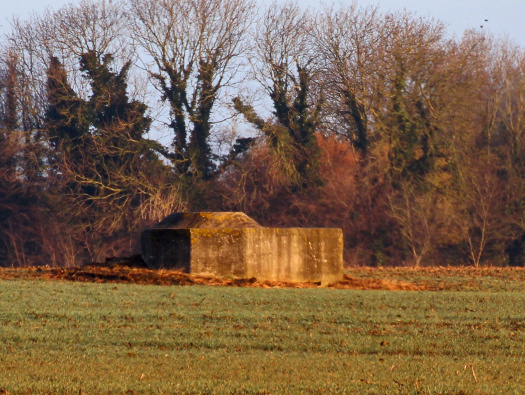 Also later two R621 group shelters were built to protect crews against heavy bombing. 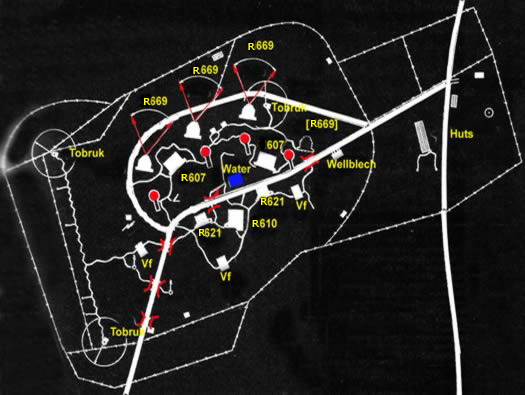 Plan of the site with four open emplacements (in red) and four R669 casemates, three were built, the forth was under construction. 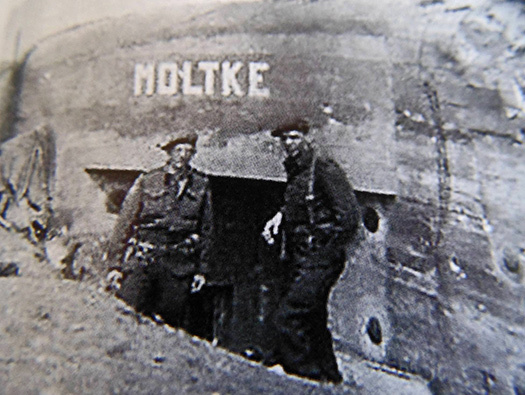 There were two R621 group shelters for guns crew and two R607 ammunition bunkers. Also one quite large R610 Battle HQ for a strengthened company which would have been the batterie HQ. R669 casemate showing the foul gases extraction pipes. Steel rear doors that should be placed but often were not. 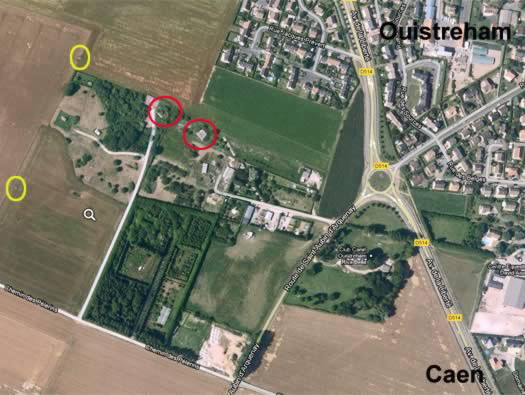 Red circles are the two R669 casemates and there is another in the woodland. 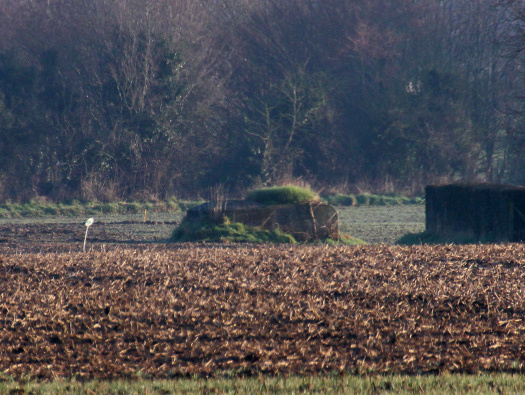 Yellow circles are the two Tobruks that can be seen across the fields. 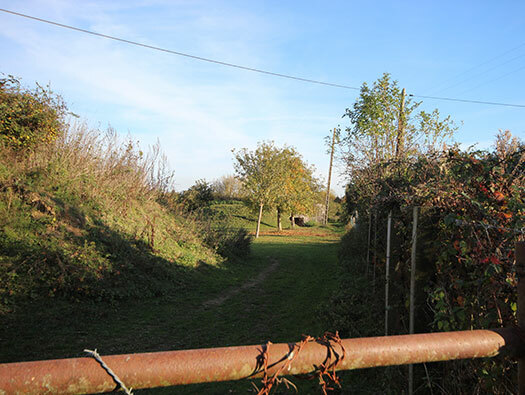 This is the track towards the batterie. Wn12 Ouistreham Château D’eau Turm 1. Looking into the rear of Turm 1 R669 casemate. Note the banks of earth still around casemate. 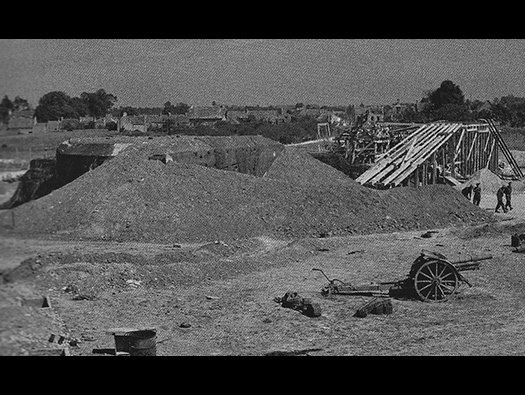 R669 casemate under construction (at Wn16 de Colleville) and one of the 10cm le.F.H.14/19(t) gun removed after its capture. Note the earth placed around the bunker. Wn12 Ouistreham Château D’eau Turm 2. Term 2 almost completely covered in earth. This is how it looked after capture the front of this R669 casemate. The holes in the concrete were cement bags screwed up and set into the wet concrete. When the concrete dried out, the paper removed and just breaks up the smooth concrete and helps camouflage it. Cleaning rods may have been hung on the wall. Allied air photo of the battery. Allied air photo of the battery and a dummy batterie set up to confuse allied intelligence and possibly take some of the bombing. This is a German artillery plan to call down a shoot on pre planned targets. If there had been a landing opposite Wn10 the code Engers would be sent and the guns would fire just out to sea to hit any landing-craft. Wn12 with Mine Field 96 covering all advances too it. 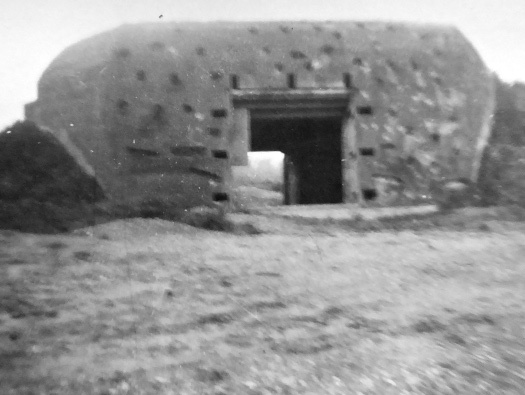 Open gun emplacement set up for a 15.5cm s.F.H.414(f) guns. Note the four wooden chocks to hold the Field Howitzer in place on the top of its turntable. Turntable for an open emplacement. 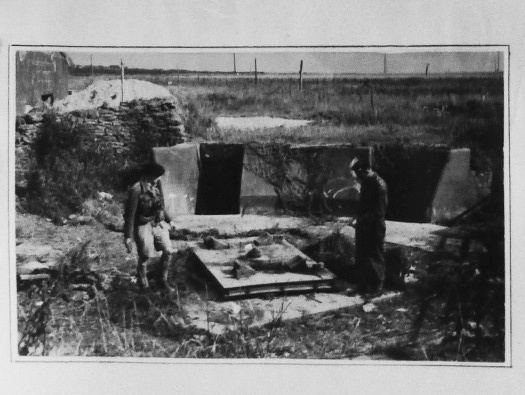 An R621 Group shelter showing after capture with British troops camping on the site. Note the two entrances into the bunker. The first is the access into the Tobruk and the second goes down into the bunker..
R621 showing the entrance into the Tobruk. I believe this is here after capture. This looks like the entrance and close combat defence of the H610 Battle HQ for a strengthened company. R669 rear entrance after capture, the vent on the left side and looks as though the metal vent has not been fitted and also the rear door frame has also not been fitted. The closer Tobruk, these would have had earth pushed up around them to help them with camouflage and makes it a bit stronger. 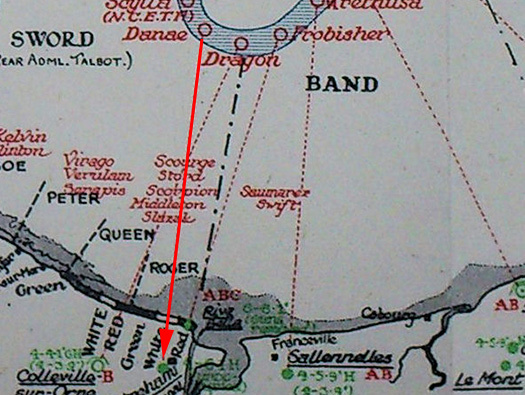 Green are the principal German batteries fired on by Allied ships on D-Day and Wn12 was attacked by HMS Danae. HMS Danae seems to have missed?? Leaving the beach and heading inland. ‘B’ Company, 2nd Batt East Yorkshire Regiment attacked ‘Daimler’. A reconnaissance of it was being made by the C.O. 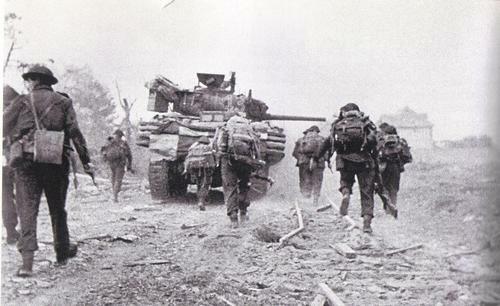 and Officers, when, in a sunken lane, a salvo of enemy fire burst amongst the group. Lt.-Col. Hutchinson was hit in the arm. 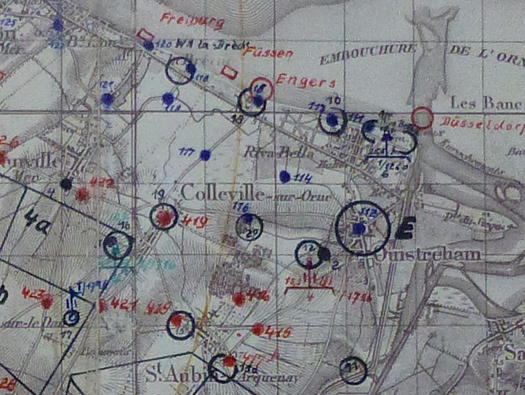 With the aid of some tanks of the 13/18 Hussars and under cover of artillery fire from the 76 Field Regiment, ‘A’ and ‘C’ Companies put in an attack on ‘Daimler’, which was quickly taken with little loss. Seventy of the enemy surrendered. Many German weapons were captured. 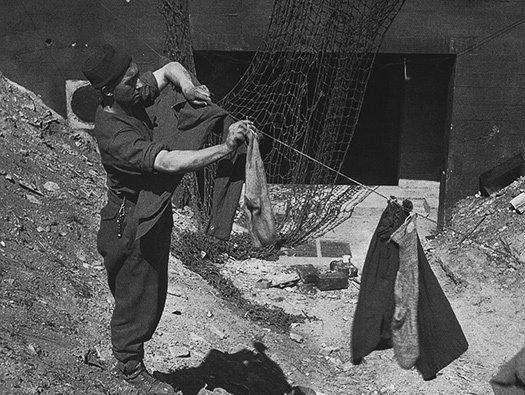 In their dugouts, the Germans had been liberally supplied with wines and champagne. These the troops gladly ‘liberated‘. 13/18 Hussars loading onto Landing-craft.